Children learn best when they are actively engaged in their lessons. Help them memorize essential sight words while fulfilling their need for movement as they use interactive activities to learn color words, such as a color matching game. Start by introducing color words to children by writing them on cards in the given color. You can use colored markers on a white card, or use a black marker on colored paper. Make two sets of either type for an independent matching activity. Make one set of each for a more advanced matching exercise. Set up a sorting activity that requires the child to place objects under the color names by color. Create three-part matching cards for color nomenclature. Make simple color bingo games, dominoes, and Go Fish cards. Also provide color books and flashcards for independent exploration. When children are starting to feel more comfortable with color words, they can start following written directions or glyphs. Give them color by number activities, and do not tell them what the color words say, so that the finished product is the control of error. 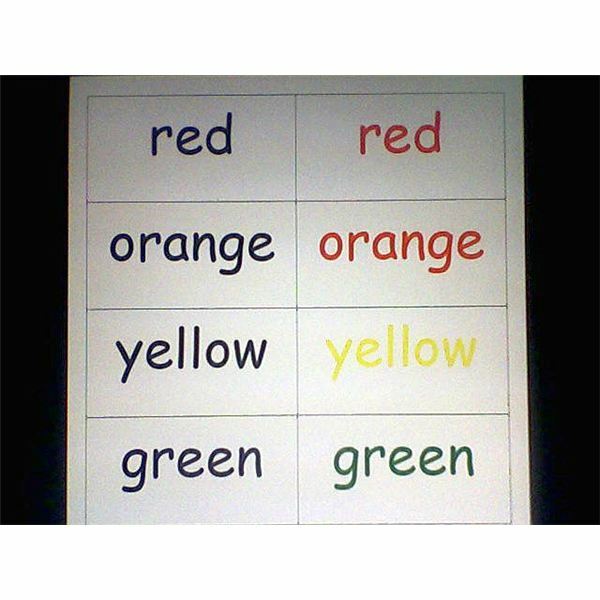 Another way to try to stump those who are getting really good at reading the color sight words, is to write the color words in different colors on cards. For example, write the word “green” in a red marker. Children enjoy using movement in interactive activities as well which can also be applied to learning the words for colors. Randomly pass out two identical sets of cards with color names to the children. At your cue, the children are to find their partner with the same card. Make it a little bit more difficult by making one set the color, and one set the color word. Have children go on a scavenger hunt around the room. Hide one set of cards around the room, and pass out the other set. Use either the matching sets, or the three-part matching set. Have children hunt for their card’s match. Or, give children a card with a color word on it, and ask them to bring back something that is that same color. Have them quiz each other, by playing these games in small groups, or with just one partner. Turn your classroom into a giant board game. Laminate pieces of colored paper, and affix Velcro or tape to the backs to attach them to the carpet. Have children draw from a deck of cards with the color names written on them. Or, cover numbers on a large Styrofoam die with color names. Each time the child draws a color name, he has to move to the next space that is that color, as if playing Candyland. All of these interactive activities to teach color words are easily made and fairly inexpensively to make by hand. Use your creative juices or even allow children to create their own versions of color words. Create a variety and mix up your teaching techniques to appeal to all kinds of learning styles.